This entry was posted in Community safety, Environment, Rothwell, Transport, Young People by Karen Bruce. Bookmark the permalink. 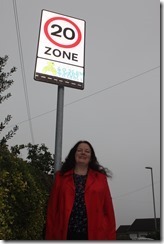 Although I agree with the 20 mph zones, unfortunately there are ignorant drivers who disregard the signs and drive at speeds in excess of the stated speed limit, making the sign worthless and costly. Proper speed cameras should be strategically placed near the schools, Wood Lane, Haigh Road etc, this would reduce the speeds of the idiot drivers who do not care about they drive. They would hopefully then lose there licences (no speed awareness course for anyone, there useless) and have their cars crushed and this would help keep the roads save to use and walk over.